Subway has increasingly taken the focus away from their Footlong of the Month offer by selecting subs which are either comparatively standard (this month’s Bacon, Egg and Cheese) or eye-openingly strange (last month’s Jalepeno Tuna Salad). At the same time, they’ve been pushing themed groups of subs for full price. This month’s theme is healthy chicken stuff. They’re promoting the Sweet Onion Chicken Teriyaki (which is always a pretty good bet), and a new BBQ pulled-chicken sandwich. All that lettuce, who needs it? No one, that's who. The marketing on a BBQ chicken sandwich as a healthy option seems kind of off to me. I can appreciate that chicken as a meat is generally healthier than beef or pork, but to me, taking a BBQ pulled meat and loading it up with lettuce and other veggies is counter-intuitive. I feel like if you’re going to eat healthy, you’re not going to eat a BBQ sandwich. I’ve had this sub twice, and both times I’ve added onions and a couple of tomatoes, but that’s it. The BBQ chicken is decent. Chicken doesn’t separate quite as nicely as pork in a situation like this, but the meat still ended up with a nice flavor and consistency. I’ve tried it with Pepper Jack and Monterrey Cheddar cheeses, both of which work well, depending on the level of heat you’re looking for. I love onions with sweet or tangy flavors, although I could take or leave the tomatoes. All in all, it’s a pretty good Subway sub. Nothing earthshaking, but worth trying if you like chicken and BBQ sauce (and if you don’t, sorry there’s not quite as much here for you on Sandwichtalk). 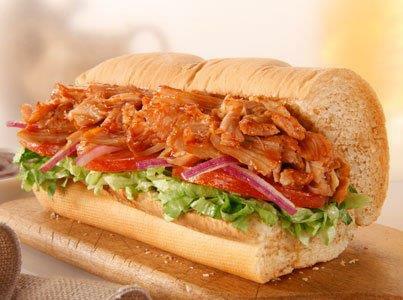 The Smokehouse BBQ Chicken sub runs for about $4.50 for a 6-inch and closer to $7 for a footlong. Try it, but ditch the lettuce. I actually totally disagree. I love this sub loaded with spinach and other veggies. Not sure why BBQ wouldn’t mix with veggies. BBQ salads are everywhere, have you tried the one at CPK?